The electoral process in Zimbabwe was thrown into disarray after some of the police officers in the country’s second largest city, Bulawayo, were allegedly forced to vote in front of their superiors at Ross Camp police station ahead of the 30 July polls. While the Zimbabwe Republic Police (ZRP) confirmed the voting exercise, which they said was part of the postal voting, the Zimbabwe Electoral Commission (ZEC), the body tasked to administer the country’s elections, refuted such activity had taken place, raising suspicion of rigging among opposition political parties. After the news of the clandestine voting went awash on social media, ZEC issued a strong statement in which they claimed the messages were false and emanating from detractors bent on destabilizing the country. Acting ZEC chief elections officer, Utloile Silaigwana, said in the statement that the electoral body was still processing applications for postal voting, adding that the messages circulating on social media were lies being peddled by those bent on causing alarm ahead of the elections. “This is hogwash and very stupid propaganda because in the first place they (social media) have photos of a police officer standing near a ballot box yet with postal voting a voter doesn’t use a ballot box. Postal is an individual who says I am applying for postal voting and he or she is given a ballot paper in an envelope and he returns it sealed,” says Silaigwana. The Zimbabwe Election Support Network issued a statement calling for transparency and secrecy of the postal voting process. 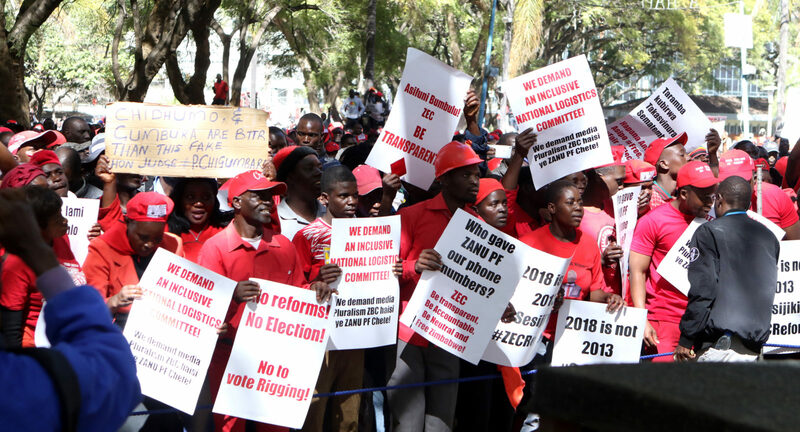 The discord between the police and the ZEC, however, has riled the main opposition, the MDC Alliance, which now says it will institute proceedings to stop the electoral process. Derek Matyszak, a Senior Researcher and Consultant at the Institute of Security Studies, said what had happened in Bulawayo was not how postal voting should be done. “The manner in which the police have used the postal vote suggests that the process was not free and they were subjected to a process which could be regarded as intimidatory,” Matyzsak said. He said the opposition political parties in the country were failing to utilise the provisions of the Electoral Act which provide some transparency in this regard. “So the opposition should already know who has been granted postal votes and should know how many can be added to the tally at each polling station, but they scream each time it happens and never know the legitimate amount of ballots to be added,” he said. Constitutional Law Expert, Professor Lovemore Madhuku, who is also a presidential aspirant on the National Constitutional Assembly ticket, said there was no need for the police to do postal voting in the first place. “Enough arrangements should have been done to arrange for the voting of the affected officers at their respective polling stations. The purported officers could vote early morning before they go to where they are deployed or they could be deployed in the areas where they are supposed to vote,” he said. Madhuku said the way the police officers had voted raised suspicions, adding that the police should not do “such stupid things”. The Zimbabwe Election Support Network in its statement urged the electoral body to shed more light on postal voting as it has been shrouded in secrecy. ZEC has indicated that about 7,000 qualified for postal voting while the ZRP officer in charge of the elections committee, Senior Assistant Commissioner Erasmus Makodza, in a statement revealed that the number of police officers who have applied for postal voting does not exceed 4,000.